This piece celebrates the fall season. It is made from a cigar box and layers of Tramp Art and real acorn caps. 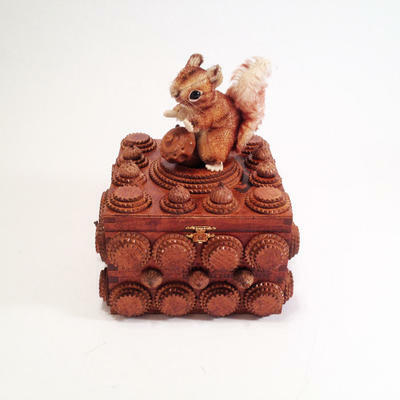 The focal point is an early Steiff Squirrel holding an antique "vegetable ivory" acorn shaped thimble holder with the thimble inside. Approximately 112 pieces of hand cut and chip carved wood have been used to create this one-of-a-kind work of art.